Hotel Catalonia Las Cortes, Madrid. 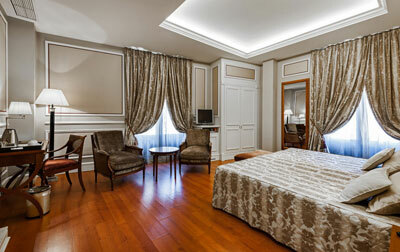 Catalonia Las Cortes Hotel Madrid. A magical hotel, where history meets modernity: Hotel Catalonia Las Cortes' eighteenth century building used to be the residence of the Duke of Noblejas and has maintained its frescoes, mirrors, stained glass while being equipped with modern comforts. Its two ballrooms have been converted into function rooms to provide your events unmatched elegance. Its location is enviable, next to the famous Plaza Santa Ana, in the Barrio de las Letras, where the bohemian life and the nightlife of old Madrid mingle. It is within the Golden Triangle of Art, so you will not have far to walk to get to the Prado, the Thyssen-Bornemisza and the Reina Sofia. Enjoy our restaurant specializing in international cuisine with a Mediterranean flavour, prepared with fresh seasonal products, and an excellent breakfast buffet, with bread and tomato, and potato omelettes. We also have special menus for groups and celebrations, and free Wi-Fi.